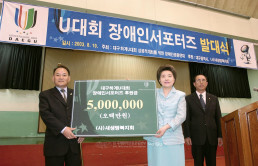 On August 19, 2003, the “Launching Ceremony of Disabled Supporters for the Successful Daegu Universiade” was held at the indoor gymnasium of Daegu Multi-Purpose Welfare Center for the disabled. The disabled supporters consisted of the members from various organizations of the disabled, but could not hold a launching ceremony for the lack of sponsors. Thanks to the donation worth of 5 million won from the New Life Welfare Foundation, they could have their launching ceremony. Wishing for a successful Universiade, we also hope that the prejudice against the disabled will be removed through the exciting cheers of the disabled supporters, and that courage and hope will be delivered to all the athletes who are attending the Universiade.